Rolex had a problem. They like to control as much of the production process as possible, but for nearly a century, they have had to use whatever materials were available on the open market. Of course, they developed relationships with foundries to supply their noble metals – but in the early 2000s, Rolex took their watch business to the next level by establishing their own state-of-the-art foundry. This allowed them to massively improve quality control and even get their research teams on improving the base materials used in their watches. Now, Rolex-exclusive 18 kt yellow, white and Everose gold alloys are being cast by hardworking and experienced foundrymen, using top-secret and highly-guarded formulas. Gold is not the only metal in your gold watch, however. Gold (Au) is a soft, dense and inert element, the most malleable and ductile of all the metals – requiring mixing with others to increase strength. Karat is the term used to measure the gold content or purity. The higher the karats, the purer the gold. 18kt gold is at least 75% pure gold. In order to make the gold stronger, any number of elements can be combined, each of them creating a unique color. 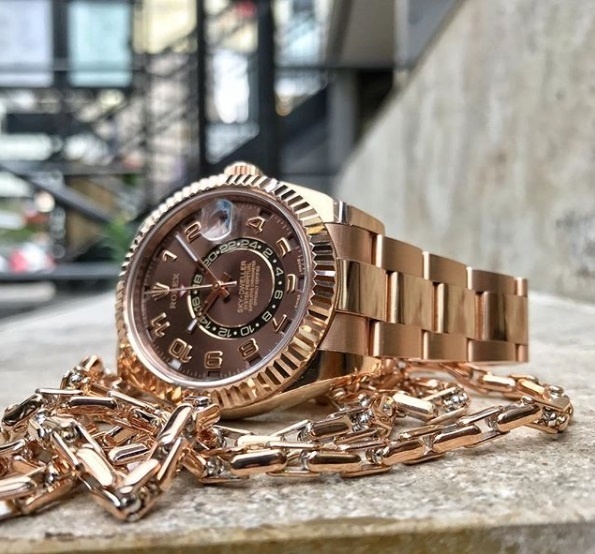 Depending on the gold, the metal could appear white, pink, even copper red made more resistant to corrosion and tarnishing, and increase the strength – all qualities needed in a lasting piece of jewelry or a watch. Pink gold utilizes copper, the only red metal chemical element. As time passes, the alloy will lose its color as it is exposed to the environment – particularly chlorine. In order to preserve the beauty of their watches for a lifetime – Rolex put it’s research and development teams and foundrymen to work. It didn’t take the great minds at Rolex very long to create and patent their own pink gold alloy: Everose Gold. Everose gold contains at least 76% gold and a little more than 2% platinum. By adding platinum along with the gold and copper, the copper is held in by the platinum – thus ensuring that the color lasts for years to come.